Did you know an average home can produce over 30,000 gallons of greywater a year? Give your shower, bathroom sink and laundry water a second life. 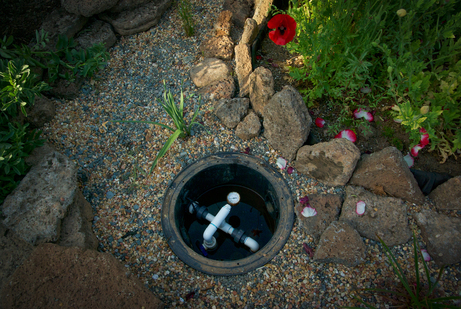 Keep your garden green during the drought by sending graywater to your landscape. Water fruit trees, lawn, ornamental shrubs, above-ground vegetables and more. Or send it back to the house and flush your toilets. We customize each greywater system to your exact specifications and site needs. Greywater systems are a smart way to reuse shower, bathroom sink, wash basin and laundry water by re-rerouting your home&apos;s plumbing to irrigate your landscape, or back into your home to flush toilets and supply laundry. Greywater can be dispersed either via gravity to a mulch basin, or via pressurized drip for more specified delivery. It&apos;s is suitable for perennial plants such as fruit trees and ornamental shrubs, as well as lawns. It is not suitable for vegetable gardens.